View More In Beer Brewing. 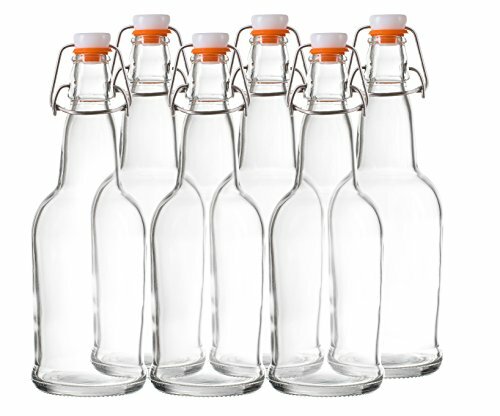 Keep your home brewed beverages at their peak of freshness and flavor with these Bellemain Resealable Cap Bottles. Simply press down the cap to seal, and flip it up whenever you want to enjoy a sip. If you love to make your own beer, cider, soda pop, kombucha, keffir, flavored vinegars and oils, or herbal teas and extracts, the Bellemain Resealable Cap Bottle is the smart choice. Made of tough, BPA-free plastic with a silicone gasket, the cap will last through many openings and re-closings. It's attached to a stainless steel wire bail that clamps the cap down to ensure a strong, complete seal and prevent leaks of air or liquid. To open it, just lift the bail and the cap slides out of the bottle's neck. Protect the health of your family and the environment with the Bellemain Resealable Cap Bottle. The thick glass withstands active handling during bottling and reusing. It will never absorb flavors or odors, or leach chemicals or flavors into your beverage. . If you love to make your own beer, cider, soda pop, kombucha, keffir, flavored vinegars and oils, or he. The cap and bail assembly slides off the bottle and comes completely apart, making it easy for you to thoroughly clean it. Each Bellemain bottle has a 16 oz. capacity. This set of 6 bottles lets you divide up a batch of soda, kombucha or keffir into generous daily servings. The Bellemain Resealable Cap Bottle Set of 6 is thoughtfully designed and carefully manufactured for exceptional performance. PERFECT FOR HOME MADE BEVERAGES: Beer, soda pop, kombucha, keffir, vinegar, cider, flavored cooking oil, herbal extracts and more. AIR-TIGHT, REUSABLE CAP: Silicone gasket seal with stainless steel wire bail prevents leaks, keeps contents fresh, and can be opened and reclosed for repeated use. FREE OF HARMFUL LEAD AND CADMIUM: Thick, sturdy glass won't absorb odors, flavors or stains, or leach dangerous chemicals like cadmium or lead like other containers. EASY TO CLEAN: Cap and bail slide off easily for convenient, thorough cleaning. If you have any questions about this product by Bellemain, contact us by completing and submitting the form below. If you are looking for a specif part number, please include it with your message.